NASA’s Solar Dynamics Observatory spacecraft captured this image of an M8.1 solar flare on Sept. 8, 2017. The image is a blend of extreme ultraviolet light in the 131 and 171 angstrom wavelengths. They call sunspots "active regions" for a reason. Active Region 2673 (AR 2673) blasted out yet another solar flare early this morning (Sept. 8), its sixth intense burst of high-energy radiation since Monday (Sept. 4). 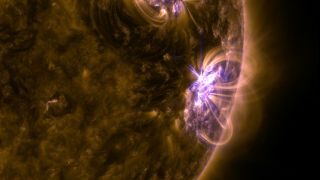 Two of the six recent flares from AR 2673 were X-class — including Wednesday's (Sept. 6) monster X9.3, which was the most powerful solar flare since 2005. Strong solar flares are often accompanied by coronal mass ejections (CMEs), eruptions that send clouds of superheated solar plasma racing into space at several million miles per hour. CMEs that slam into Earth can trigger geomagnetic storms, which can temporarily disrupt power grids and interfere with satellite communications, among other negative effects. And some lucky skywatchers have gotten an aurora eyeful this week, thanks to CMEs associated with an M-class flare on Monday and Wednesday's X9.3. Though this latter CME hit Earth with just a glancing blow, the storm it generated brought the northern lights within sight of viewers as far south as Arkansas overnight Thursday (Sept. 7). Unfortunately for skywatchers, that storm seems to be tapering off, and supercharged auroras probably aren't in the cards tonight or beyond, experts said. "I can't rule it out, but I don't think the chances are good," Bob Rutledge, of the National Oceanic and Atmospheric Administration's Space Weather Prediction Center (SWPC) in Boulder, Colorado, told Space.com. AR 2673 also continues to rotate away from Earth toward the sun's limb, so any other CMEs it blasts out in the near future likely won't affect our planet, added Rutledge, who leads SWPC's forecast center. Editor's note: If you snap a photo of the northern lights and you'd like to share it for a possible story or image gallery, please send images and comments to Space.com at spacephotos@space.com.